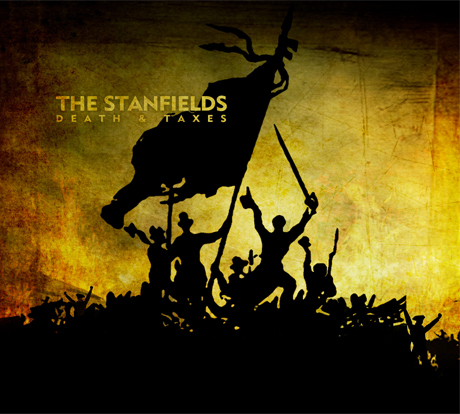 Back in 2010, Maritimes Celtic punk unit the Stanfields dropped their debut disc, Vanguard of the Young & Reckless, which we called "a hard-drinking good time." Well, get ready to clink those pint glasses again, as the outfit have just announced their next set, Death & Taxes. The Haligonians' sophomore set drops September 18 through GroundSwell Music/Warner Music Canada. While the album promises the same kind of folk-meets-punk arrangements and the gruff and growly vocals of singer/guitarist Jon Landry, the band's lyrics have apparently got a bit darker. A press release further explains that the album deals with the "unspoken side of Maritime living and themes of poverty, war, despair, greed and capitalism." Landry explained in a statement that musically, the band have become "a louder, faster version of ourselves" in part due to their experiences on the road. Fans will soon be able to check out the speedier ensemble for themselves, as a tour schedule is expected to be revealed in September. You could potentially catch one of those gigs in your very own home, as the band are offering a kitchen performance as part of a deluxe pre-order package. Extra album goodies you can grab at various pay-level scales include a digital download, backstage passes, assorted merch and the aforementioned house party. You can find out more info here, where you can pre-order the album.